I guess I really love this Four Rib Braid cable pattern because I find myself returning to it. It began when I used this cable for this cable bag (pseudo-pattern). Then when DH got me an iPod Touch for my birthday, I decided to use the same Four Rib Braid cable pattern on the iPod Sock (pseudo pattern) I made for it. I use my iPod daily so I see the Four Rib Braid cable pattern when I take it out of its iPod Sock. There is something ineffably appealing about its familiarity. 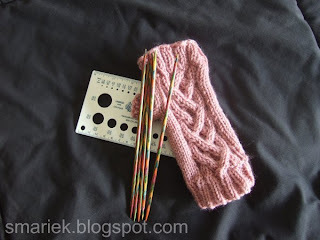 And then I couldn't help but think what a wonderful cable pattern it would be on a pair of fingerless mitts! -- Worked 8 rounds of ribbing at wrist. -- Worked 2 repeats of pattern, plus 3 more rounds ending on row 3. -- Worked 6 rounds of ribbing at end of mitt. -- Slapped on a thumb. 16 stitches, 4 rounds stockinette, 2 rounds K1P1. -- Try 12 or 14 stitch thumb next time. The 16 stitch thumb seems a smidgen too large. -- Try stockinette stitch for the thumb next time. I thought the K1P1 on the thumb would prevent the stockinette from rolling, but I don't like how this looks in the worsted weight yarn. I could type up an outline or pseudo-pattern for how to make these mitts, however I think you can easily figure it out by looking at my outline for the Four Rib Braid iPod Sock I made. -- Cast on 44 sts (or maybe even 48 sts?) to make a larger mitt. 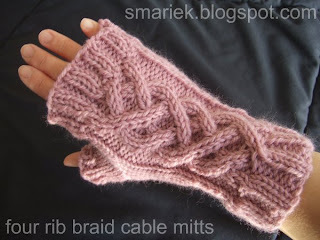 -- Make the palm side of the mitt ribbing (instead of stockinette) for more "stretch" factor. -- More stitches in thumb to make it larger. Take a look at what I received in the mail today! These are my very first Knit Picks Harmony DPNs, size 4.5 mm (US7). I did not know what to expect. I was afraid they might be too bright/colorful in a gaudy kind of way. They're gorgeous! The DPNs are 8 inches long, you can see how it compares to the Four Rib Braid Cable Mitt. The rectangular thing underneath is Nancy's KnitKnacks needle gauge. I love it! It includes the non-standard needle sizes like 3.0 mm. That makes me happy! I need a few more of these. This is way better than the Susan Bates needle gauge. Thanks Barbara for turning me on to these! She is the Wise Woman of Los Angeles. Ask her anything and she will advise you well. I was hoping to have more to show you guys. I do have something, but it is a secret, so y'all gonna have to wait until February. It'll be a nice surprise. And if you think that's gonna kill you, imagine how I feel wanting to tell you all about it!!! Still waiting for my Knit Picks nickel plated DPN set to arrive. It's on back order until 23 Dec 2008. Sigh. I want to play with them NOW! I threw out a few more books for the Throw Out 50 Things by 1 Jan 2009 thing (see 3 Dec 2008 post), I'll post about that another time. I also have yarn to show you. I meant to do those things yesterday but lost much of my day running around doing "non-me" stuff, spending time at urgent care, and having DH at home when he decided to take the day off at the last minute. I didn't get any computer time yesterday and had hoped I could catch up on blog reading yesterday. We put up our Christmas tree. Missy enjoyed helping with that. She keeps asking, "is today Christmas?" She has simple concerns. She keeps asking whether the tree will still be there when she wakes up the next morning. I think she's afraid we'll take it down or that it'll disappear, even after many assurances that the tree will still be there until Christmas day and that we will all help to take it down. I've started wrapping some gifts to put underneath the tree. Missy likes to handle the gifts. By the time Christmas comes around, people will receive gifts wrapped with well-crinkled paper! I might even end up re-wrapping some of the gifts if they look really shabby by then. The mitts are beautiful! I can see why you keep coming back to that braid. I have some cabled mitts that I really love, too; they're made with an inexpensive wool blend (wool-ease) with a sparkly tinsel-y fiber in it. Missy would like the shine, I think! I have enjoyed knitting with the Harmony needles, a friend of mine who is an instructor was the one who introduced me to them, but I am using the circular needles. I will have to check out your new gauge and as far as the mitts, I can't blame you one bit for returning to this cable design, it is fab. Those mitts are just beautiful!!! 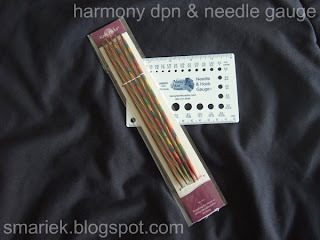 I love my harmony needles. They are so soft and smooth. Those mitts are awesome! and I love pink. You need to stop coming up with patterns (not!!) my queue is getting waaay to long, LOL. We gave up putting wrapped gifts under the tree. Actually, several years (like when we'd have a 13 month old, LOL), we put up a miniature fake tree. It was so tiny and getting shabby, but had special meaning to me. I long for the day I can really decorate for Christmas again. Although we love the kids' reactions when they wake up and see all the presents (even though they weren't all from Santa, or all for them, they all appeared Christmas morning). I never thought about the ability to use cell phone or video games with the fingerless gloves, thanks for reminding me that most of the world is more advanced than me, LOL. Pretty mitts. Your previous post makes me wonder why the Knight and I decided to pick up our Palms again a couple of months ago. Not a good plan, eh? Thanks for the compliment, but you make me blush! If any of the KP items don't fit or fail or break or whatever, they're really good about replacing them, no problems. Just when I was settling in to knitting Maine Morning Mitts - because they're easy and yet look and feel so good - you have to come up with a cable pattern I really, really HAVE to knit. OK, these are going on the 2009 gift list. Now that the out-of-town and out-of-country prezzies are off on their travels, I can focus better on the Throw Out 50 Things list. I'm so jazzed about doing some serious de-cluttering. I inherited a major pack rat gene from my grandma, a double dose, since it totally skipped my mom.